For a church currently in the process of re-building its organ, it might seem a little ambitious to choose Louis Vierne's 1899 Messe Solennelle to celebrate Easter Day when the mass calls for not one, but two organs. We were in Manchester for Streetwise Opera & The Sixteen's The Passion (see my review) and so attended 10:30am Sung Eucharist at Manchester Cathedral on Easter Sunday (27 April 2016). The cathedral is in the process of replacing its organ. The historic instrument was damaged in the war (when the cathedral was hit). The Scott case on the 15th century rood screen was never fully replaced and this will be remedied with the new organ, which will have a spectacular new case mounted on the screen. The new organ will be mechanical action, and is intended to be far easier to maintain than the old stop-gap one. 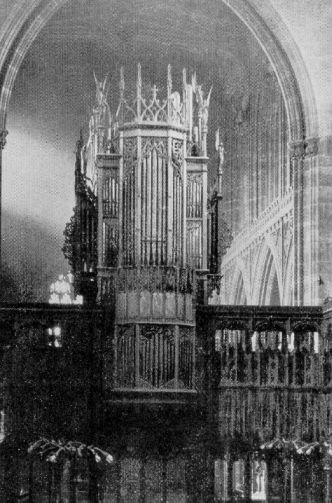 The original organ was a William Hill & Sons, from 1871 and rebuilt in 1910 and with restorations by Harrison and Harrison, who did the post-war salvage re-build. At the moment the rood screen is being prepared and is covered in scaffolding. So Sung Eucharist took place in the nave, well forward of the screen, with the choir placed at the side adjacent to the console of the replacement, electronic organ. Acoustics were not ideal, and from where we sat we heard rather more of Geoffrey Woolatt's excellent organ playing than the choir. Directed by Christopher Stokes, the choir consisted of six men and around a dozen or so trebles (mainly girls with one or two boys). The opening introit, Byrd's Haec Dies was sung from the rear of the choir, and the admirably clear focussed sound of the trebles gave me no hint whether they were boys or girls, an excellent blind test. We heard the Gloria, Sanctus, Benedictus and Agnus Dei of Vierne's mass, a glorious piece designed for the two organs of a large French church, the choir organ and the grande orgue in the nave.There are few UK churches able to reproduce this but Geoffrey Woollatt clearly revelled in the virtuoso organ part. I have always rather loved the Sanctus with its outrageously perky organ part (shades of Lefebure Wely). We were also treated to Gibbons If ye be risen again at Communion and Weelkes I heard a voice at the Dismissal, both with excellent solos, pieces which admirably suited the style and size of the choir. It has to be admitted that they were a little on the small side for the Vierne mass, but coped admirably with some finely vibrant singing. I remember services at Manchester Cathedral from my student days, combining ceremonial with an element of approachable informality, and this has evidently continued. The president was the Very Reverend Rogers Govender, Dean of Manchester Cathedral, and the Bishop of Manchester, the Right Reverend David Walker gave a thought provoking sermon. After the service we were able to wander round to see the installations by artist Julian Stair, a series of highly evocative pots, part of a Lent trail in Manchester linking art and religion. The church only became a cathedral in the mid 19th century, but the church is finely historical (though most of the stonework was replaced in the 19th century). 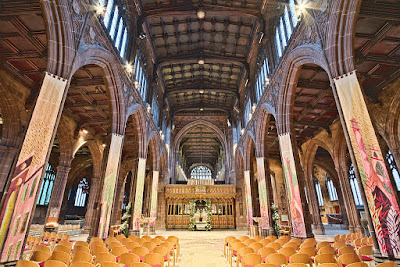 It was originally rebuilt in the 15th and 16th century with a fine surviving set of choir stalls alongside the screen. Thanks to the preponderance of chantry chapels in the medieval period it has one of the widest naves in the UK; when the chantries were dissolved during the reformation, the screens dividing them were removed giving the church the appearance of being double aisled. You can support the Manchester Cathedral organ appeal at their website.